The topics of Science, Technology, Engineering, and Math (STEM) and Girls in Engineering have received a lot of press this past year. Yes, we need more girls participating in STEM industries. Yes, we need more girls studying STEM topics in high school and college. Yes, parents, schools, and society need to support all young people pursuing STEM fields. I continue to be amazed every time I hear the facts: “American students score 23rd in math and 31st in science when compared with 65 other top industrial countries. In math, we are beaten by countries from Lichtenstein and Slovakia to the Netherlands and Singapore. In science, we are beaten by countries from New Zealand and Estonia to Finland and Hungary.” (From a CNN 2012 article). Tomorrow, February 22, 2014, a memorial service is being held at the Golden Gate Yacht club in San Francisco for Ruth Gordon Schnapp who died on January 1, 2014. My heart is filled with great loss - as well as pride, in the fact that Ruth's amazing life story will live on in my book for young readers. Also, today marks the last day of Engineering Week, with the exciting Introduce a Girl to Engineering Day this Thursday. Girl Day is a movement that shows girls how creative and collaborative engineering is and how engineers are changing our world. With hundreds of events happening each year, together we are driving the conversation about girls and engineering. Host a Girl Day event and make a difference to the girls (and their moms) in your community. Ruth Gordon Schnapp is one of the 22 inspirational women that I wrote about in Women of Steel and Stone. As we talk about the lack of women in STEM fields, we should be supporting and promoting the achievements of the women who have paved the way. Beginning my research, I googled Top Architects. What surprised me was that on one particular list of Top 100 Architects there were only two women. Two women out of 100 architects? Those odds seemed shockingly way off. In my further research, I uncovered several amazing women in architecture, engineering, and landscape architecture whose stories needed to be told and were over looked. Young readers needed to hear about these inspiring stories. As Ruth’s health was failing, the family asked me to write an obituary for their mother. The press did not pick up on the news story of her passing. So, to celebrate Ruth Gordon Schnapp’s life and to promote Engineering Week, I thought I’d share the obituary that I wrote. Ruth Gordon Schnapp, the first female structural engineer in the state California, played pioneering roles in increasing the number of women in engineering fields, as well as improving the safety of hundreds of hospitals, schools, and other buildings. Mrs. Schnapp, 87, who had a passion for math that led her to a 41-year structural engineering career that included building safer schools and hospitals in California, died January 1, 2014, in Los Banos, Calif. 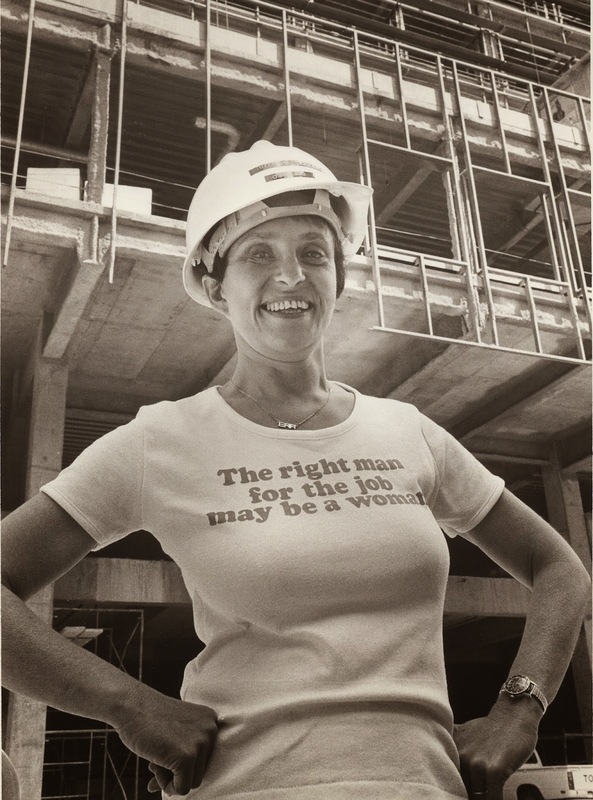 Her first job was with the San Francisco structural engineering office of Isadore Thompson, after being rejected by several companies who told her, “We don’t hire women engineers.” Thompson told Schnapp that he didn’t care if she was green, just as long as she could do the job. Schnapp also worked for engineering firms Bechtel and Western Knapp before her 29-year career for the State of California. Schnapp opened her own business, Pegasus Engineering, in 1984 and retired in 2001. Schnapp’s parents, Solomon and Lea Gordon, were Lithuanian immigrants who first settled in Dallas where her sister, Clara, was born. After that, the family moved to Seattle where Schnapp was born on September 19, 1926. Excelling in school, Schnapp said she often saved her math homework for dessert because it was the most fun. She dreamed of becoming a concert pianist, but her parents cautioned her against her following her dream, stating: “You never can tell what’s going to happen. You have to study something for which you can make a living.” In 1942, most parents were encouraging their daughters to marry and have children. Not knowing what an engineer did except that it involved math, Schnapp chose that path. After she was accepted to Stanford, she had to first find out where it was. During her summer breaks, she worked for Boeing in Seattle, one summer participating in structural engineering changes to the B-17 bomber. When World War II ended, she was forced to take a typing job with the company at a lower pay. According to Schnapp, just to spite Boeing and its sexism, she was the slowest typist they ever had. Schnapp was the only woman to graduate from Stanford in 1948 with a bachelor’s degree in civil engineering. With the support of her male professors, she went on to earn her master’s degree in structural engineering in 1950. Starting in 1953, after receiving her civil engineer state license, Schnapp worked for the state of California for 29 years, designing and constructing school buildings to make them more earthquake resistant. In 1959, Schnapp passed the test for her structural engineering license — 20 years before another woman would earn that license. Schnapp loved structural engineering, and she especially loved being out in the field. She traveled a seven-county area of Southern California, checking schools, hospitals and other construction projects. Some of Schnapp’s more high-profile projects were the San Francisco Public Library, San Francisco Asian Art Museum, San Quentin Prison, Palace of the Legion of Honor, San Francisco General Hospital, and the Marin General Hospital. She married Michael Schnapp in 1950. The ceremony was performed in the old house of Lillian Gilbreth, the mother in Cheaper by the Dozen, another famous industrial engineer and role model for girls in those fields. Michael died in ____. With their mutual love of boats, the Schnapps bought a 26-foot-long sailboat and started racing. In 2001, she received the Yachtsman of the Year Award from the Pacific Inter-Club Yacht Association. For many years, the Golden Gate Yacht Club has held the Ruth Gordon Schnapp Regatta. Some of Schnapp’s many accolades include being named the first woman member of Structural Engineers Association of Northern California in 1953; the first woman president of the Bay Area Engineering Council in 1982-83; and the first woman to receive a Tau Beta Pi’s Eminent Engineer Award in 1995. A staunch advocate of women’s rights, in 1980, Schnapp took part in a public demonstration at the Pacific Stock Exchange, during which she chained herself to the building for five hours to protest gender discrimination. Fittingly, Schnapp’s story will continue to serve as a role model in a new book for young adults just released last week, Women of Steel and Stone by Anna M. Lewis. Schnapp is one of 22 inspirational women architects, engineers, and landscape architects profiled in the book, excepts from that book have been included here. Her sister, Clara Gordon Rubin, who died in 2002, was also a supporter of women’s rights and fought to improve gender equality among civil service workers in Seattle for four decades. She is survived by her three children, Madeline, Marcia and Michael, and several grandchildren. Thank you, Ruth, for all the girl engineers that have followed your lead and for the young girls you will inspire to build great things. I have been telling her story at libraries, historical events, and other venues and hope someday that I will find a publisher who thinks this story is worth sharing with a wider audience! Carol, thank you so much for your comments. I will have to check out that Lillian Gilbreth picture book. Lillian and Emily Roebling are 2 engineers in WOMEN OF STEEL AND STONE - wonderful stories. I'd love to hear your thoughts if you get to read my chapters. Loved reading your blog post. Thank you for that link. Biographies book list is up!